When I was 12 the pressure cooker blew up. It was summer, the middle of peach harvest. I was alone in the house with my brother, Scott, still a toddler. The blast plastered peach over the walls and shot the lid into the ceiling. Scott screamed and we raced to the “lower ten” where my mom was driving the flatbed through the orchard as my dad hoisted boxes filled earlier in the day. I don’t remember much more, but I know I shied away from the pressure pan as I took over more and more of the family cooking. A decade later, I was in remote East Africa where bottled gas fuel was costly and the pressure pan tenderized the tough local beef, steamed breads and hastened canning with minimum flame time. For the next 40 years I banished the pressure cooker from my kitchen. I had fallen under the spell of Julia Child, fully convinced that only slow, low cooking brought the best flavor and tenderness. During the years of Mary Jo’s Cuisine, the restaurant, my heavy commercial baking ovens with thick iron floors that held residual heat for hours made slow cooking supreme. Never before had I turned out such succulent stews and pots of melting beans. When the restaurant closed, I missed the Blodgett ovens and the big gas jets of the Garland range, and I still struggle with the mincing heat of a home stove. Then two years ago as I was working in the kitchen section of the church rummage sale, I faced the pressure cooker once again. I thought, maybe I should give it another go and for a couple of bucks what did I have to lose? The pressure pan’s now back as a regular kitchen tool used at least once a week to cook beans. For most people who are able to eat legumes, beans are one of the great foods of the world, both for flavor and nutrition. They are sustainable, inexpensive and packed with minerals. In fact one pound of dry beans will yield protein equal to a 3 ½ pound chicken or 1 ¼ pounds lean ground beef. Yet so often home cooked or even restaurant cooked beans aren’t completely tender, and canned beans are often laced with sugars or preservatives. The best beans must be satin soft, meltingly tender, though not stewed to the point of mush. I count on a pound of beans a week to add to soups, salads, stews or tacos. State of the art pressure cookers cost at least $50, but there will surely be one or two at your local church rummage or neighborhood garage sale. Make sure the rubber sealing ring is in good order before you begin, and keep a plentiful supply of dried beans in your larder for variety. Cooking times vary for different beans. You will find a handy guide in the manufacturer’s directions. Here’s a basic recipe using a 1970’s pressure cooker. The night before: pour the beans into a wide bowl and check for any small pebbles (most unlikely, but always look.) Cover generously with cold water and allow to soak overnight. The next day, drain the soaked beans. Pour beans into pressure cooker. Cover with 5-6 cups cold water, add fat of choice and optional garlic, chilis, bay leaf. Twist on lid to lock, top vent pipe with steam valve with weight, turn heat moderately high and allow pressure to come up. Air vent will pop up; weight may rock. Immediately reduce heat to low and time 30 minutes for great northern beans or 35 minutes for black beans. When cooking time is up, turn off heat and allow cooker to stand until air vent drops, meaning all pressure is released. Open lid and season beans with salt. Beans may look as though they have burst slightly, but they will retreat to shape as they cool. Taste their luxury. For beans less soft, reduce cooking time 5 minutes. Makes 2 quarts cooked beans in broth. Use within 5-6 days or freeze in pint containers. If beans begin to develop a slight smell of mustard gas, skim any white film and bring to a boil. 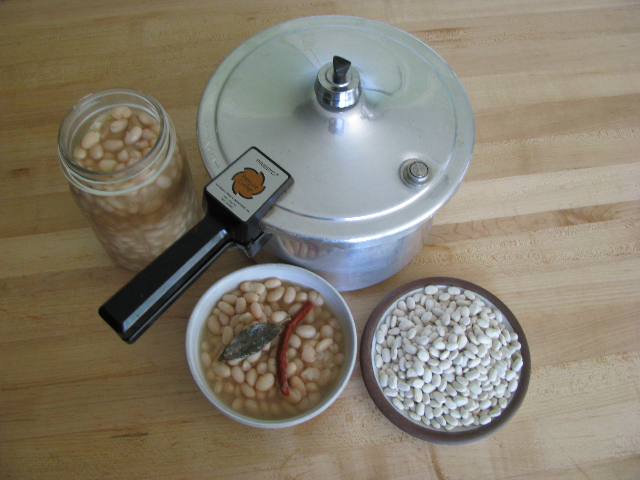 Beans keep better in glass jars or stainless steel than in plastic cartons. This entry was posted on May 25, 2010 at 9:17 pm and is filed under Uncategorized. You can follow any responses to this entry through the RSS 2.0 feed. You can leave a response, or trackback from your own site.